An easy dill pickle recipe, perfect for preserving pickling cucumbers. Prepare canner, jars and lids. Wash the jars, lids and screw bands in hot, soapy water. Rinse well and drain (you don't need to dry them). Place a rack in the bottom of a boiling-water canner, then place the required number of jars on the rack. Add water to the jars and the canner until it reaches the top of the jars. Cover the canner and bring the water to a simmer (180 degrees F) over medium heat. Do not boil the jars. Keep jars hot until you're ready to use them. Place the lids in a small saucepan, cover with water and bring to a simmer (180 degrees F) over medium heat. Again, do not boil the lids. Keep lids hot until you're ready to use them. Set the screw bands aside, they do not require heating. In a large stainless steel saucepan, combine vinegar, water, sugar, pickling salt and spice bag. Bring to a boil over medium-high heat, stirring to dissolve the sugar and salt. Reduce the heat and boil gently for 15 minutes. Working with one jar at a time, remove a jar from the canner, pouring hot water back into the canner. Place the jar on a heat-protected work surface, such as a wooden cutting board or towel. Place 1 bay leaf, 1 garlic clove, ½ teaspoon mustard seeds and 1½ teaspoons dill seeds into each jar. 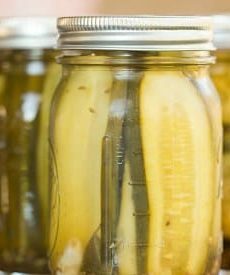 Pack cucumber slices into hot jars to within a generous ½-inch of the top of the jar. Ladle hot pickling liquid into the jar to cover the cucumbers, leaving ½-inch headspace. Slide a nonmetallic utensil, such as a rubber spatula, down between the food and the inside of the jar two or three times to release air bubbles. Adjust headspace, if necessary, by adding more hot pickling liquid. With a clean damp cloth or paper towel, wipe jar rim and threads. Using a magnetic or nonmetallic utensil, lift a hot lid from the water and place it on the jar, centering the sealing compound on the rim of the jar. Place a screw band on the jar. With your fingers, screw band down until resistance is met, then increase to fingertip-tight. (Do not use excessive force to tighten.) Return the jar to the rack in the hot water-filled canner. Repeat filling steps until all jars are filled. When all of the jars are in the canner, adjust the water level in the canner so that it covers the jars by at least 1 inch. Cover the canner with a lid and bring the water to a full rolling boil over high heat. Once the water is boiling hard and continuously, process (continue boiling) for 15 minutes. Turn off the heat, remove the lid and let sit for 5 minutes. After 5 minutes, remove the jars, lifting them out of the hot water without tilting them. Don't dry the lids or jars at this point. You don't want to disturb the lids while the seal is being formed. Place the jars upright on a towel in a draft-free place and let cool, undisturbed, for 24 hours. When the processed jars have cooled for 24 hours, check the lids for seal. Remove the screw bands and with your fingers, press down on the center of each lid. Sealed lids will be concave (they'll curve downward) and will show no movement when pressed. Jars that have not sealed properly must be refrigerated immediately. Use unsealed refrigerated product within a few days. For the jars that have good seals, with a damp cloth, thoroughly wipe lids and jar surfaces to remove any water residue or food particles. Store the sealed jars of jam in a cool, dark place for up to 1 year. Note: In place of the dill seeds, you can substitute 5 heads of fresh dill (the yellow flower portion) or 2 teaspoons dried dillweed for each jar (10 teaspoons total).